Acaciastraat 68 Price asked € 1.350 p.m. ex. Within walking distance of the European School completely renovated, spacious cozy FULLY FURNISHED 4- room apartment on the 1st floor with large sunny balcony facing southeast with a lot of privacy and many original details. Through open porch, entrance apartment on 1st floor. With 3 steps to spacious hallway with cupboards , corridor, toilet, storage room with meter cupboard. Cozy and bright living-/ dining room approx. 10.78 x 3.49 with 2 fireplaces, beautiful wooden floor and French doors to sunny balcony approx. 4.96 x 2.97 facing southeast. The kitchen has lots of cupboard space and several appliances such as gas cooker, hood and oven, fridge- /freezer combination and dishwasher. L-shaped bedroom at the front approx. 3.42 x 3.33 and bedroom at the back approx. 4.96 x 2.58. Bathroom with shower, washbasin, design radiator and mechanical ventilation. Apartment not rent to students / friends. The maintenance situation inside as well as outside is good. The apartment is re-wallpapered, painted and equipped with a new bathroom and toilet. The apartment has lots of privacy at the front and rear. Living surface approx. 95 m². The apartment enjoys plenty of privacy and does not overlooked by neighbors at the front as well as at the back side. 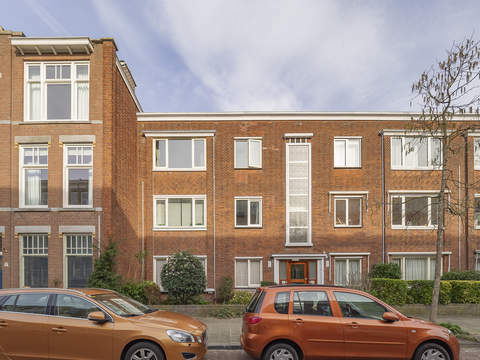 Around the corner from shops on the Fahrenheitstraat and Goudsbloemlaan, nearby Reinkenstraat, Centre, Hague city center, Frederik Hendriklaan. Public transport (RandstadRail Line 3 and line 12) and main roads through Hubertustunnel and Westland Road. 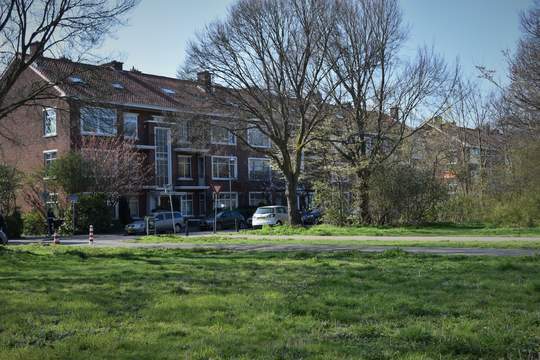 Close to European School of the Hague and various schools, sport facilities such as tennis, soccer, hockey, horseback riding and handball. Boulevard of Kijkduin, “Bosjes van Poot and Bosjes van Pex” and cycling distance of dunes, beach and sea!